A launch of the play area at Swiss Valley took place during the school half-term week. Pictured at the launch is the Chairman of Council, Cllr. Martin Davies, Councillors of the Swiss Valley Ward, local children and parents. Parents expressed their delight with the new modern equipment which had been installed and the safety surfacing covering the whole area. Cllr. Carol Rees, Leader of the Rural Council said, ‘we listened to the community at the two consultation events and provided what was asked for’. The £81,000 scheme was supported by funding from The Veolia Environmental Trust to the value of £35,960 and CWM Environmental Limited by £15,000. Both grants were awarded via the Landfill Communities Fund. The Council’s outlay was £30,000. 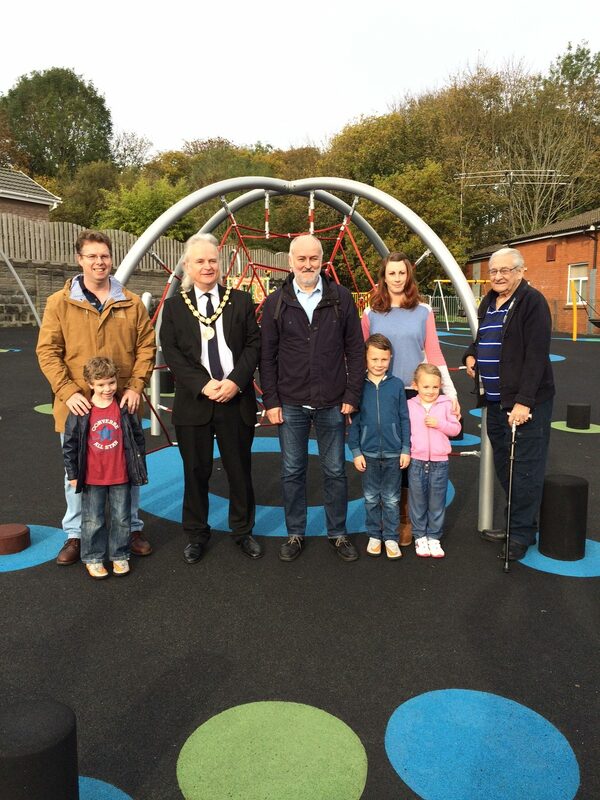 Andrew Budd, Grant Manager for the CWM Community and Environmental Fund, said “we’re delighted to see what a difference our grant has helped make for the local children who now have super new play equipment to enjoy”. The Landfill Communities Fund (LCF) is an innovative tax credit scheme enabling Landfill Operators (LOs) to contribute money to organisations enrolled with ENTRUST as Environmental Bodies (EBs). EBs use this funding for a wide range of community and environmental projects in the vicinity of landfill sites. LOs are able to claim a credit (currently 5.7%) against their landfill tax liability for 90% of the contributions they make. Since its inception in 1996, over £1.3bn billion has been spent on more than 51,000 projects across the UK. For further information, please visit www.entrust.org.uk or see HMRC’s general guide to Landfill Tax. The Veolia Environmental Trust has been supporting community and environmental projects through the Landfill Communities Fund for 18 years. Since we were established in 1997, Veolia has supported us by contributions of over £64 million to 1976 projects. We have helped fund a diverse range of projects, including the repair of woodland footpaths, the renovation of community halls and the installation of playgrounds and play areas. For more information, or to find out how to apply for funding, visit our website www.veoliatrust.org. CWM Environmental Limited’s (CWM’s) goal is to increase the amount of reuse, recycling and recovery from all waste streams which are disposed at Nantycaws Landfill Site, Household Waste Recycling Centres, Transfer Stations and the Materials Recycling Facility where CWM manages your materials in Carmarthenshire. In 2007, the CWM Community and Environmental Fund was established, enabling CWM to work in partnership with GrantScape, who are an enrolled Environmental Body under the LCF. This grant programme supports projects in Carmarthenshire delivering significant environmental benefits, creating local jobs, and improving the lives of communities living near landfill sites by providing new and better amenities. Since its launch, the Fund has provided over £2 million to more than 100 deserving projects across Carmarthenshire.